Managing Energy in Non-Domestic Buildings: Research Insights from Motivation to Lighting as a Service! Brief notes from the TEDDINET symposium: how office-dwellers don't grok energy physics, and lighting-as-a-service turns out to be nothing new! Offers of free type pressure check with environmental, financial or neutral headings in VA US. The environmental coupon message was taken the most. Those most influenced by 'green' workspace messaging are those who are weaker at home. Reduce conflict between biospheric and other values. Provide good messaging and leadership in the workplace. Motivate behaviour change in shared workspace environments (focused on people) using information feedback and appropriate goals. Real-world, multi-disciplinary, real impacts seen. 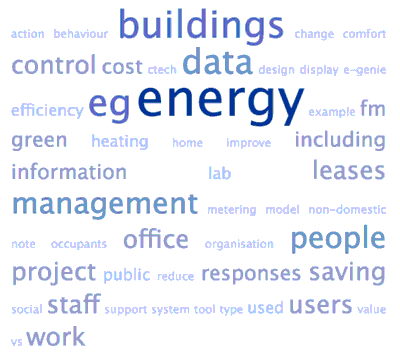 Increasinging energy use is taken from the hands of the end user and put into the hands of a Facilities Manager (FM). FM's job is "keeping things running" including BMS wrangling, and dealing with uncooperative staff. Lots of reactionary fire-fighting. In spite of clever BMSes, FMs develop 'informal' views from 'walking around' rather than using the detailed BMS-gathered data. Energy use is seen as utility, cost, and a 'right' by different groups. Trying to cut out staff is unhelpful as they will find creative work-arounds. No agency for staff means that the users and controllers of the buildings have continuing conflict of interests. Energy costs low as fraction of overall costs so not high priority for senior management. (~1% for school I am resources committee chair of, for example.) So staff may have to go over FM head to senior management to drive better working conditions. How to encourage employees to reduce energy use in the workplace? Why would employees do this as they get no direct benefit? Altruism? People do get self benefits from volunteering, eg giving blood. Lower numbers caused reduced impact (eg £ rather than kgCO2), but having normalised the numbers to (say) equivalent 'units' then cost/money displays were more effective/motivational than CO2. In the second research line, how to deal with free-riders on shared resources? The are negative responses to free-riders, and want them 'punished' by (say) an employer rule or energy champion. What if the free-rider has a genuine need, eg health reasons? In this case, less negative, and people will work harder to compensate for the person who cannot reduce consumption. So be clear about illegitimate vs legitimate excess use of communal resources. Technical interventions to fix eg, system setup errors, such as running systems when no one was using them, and no one notices even though energy is wasted. Group story telling (bringing people together in 'safe' space) helped expose some of these issues. People worry that energy efficiency is by sacrificing comfort. Instead it is possible to avoid consuming energy by mistake, eg heating on Min-Sat but building only used Mon-Fri; no comfort penalty for having heating off on Saturday! Make it clearer to users what the system is doing, eg visually, to make these errors easier to spot, eg with simple semi-public display on a calendar in the kitchenette where people may loiter anyway. Tested for 3 weeks in 5 (UK) public libraries. Library staff liked it to talk about like the weather, and the display motivated them to try to tweak controls. Developed e-Genie: tailorable energy information and "take action" screens. "Take action" screens including discussion spaces and a pledge tool (with planning support). The initial deployment didn't have a clear use case, and users were not sure what do do with the system. Some fixes including removal of need to log in, and to message the FM. Next deployment had higher engagement, with more emphasis on social/group behaviours, rather than individual. Information is not enough: also need people to capture the right kind of information such as how stuff is being used, present the information, work through the information (eg workshops). Capability: improve communications between staff, FM, senior management. Opportunity: Create new norms, policy and strategy. Motivation: Work with social psychology eg 'warm glow'; also change beliefs to spill over into home behaviour. Toolbox: e-Genie, energy literacy, feedback, pledging, supporting manual. Workshop templates and presentations: capturing maps of use on office plans, showing effects of practices on energy use, developing efficient new strategies. Games: idlewars! (Leaving your screen on unattended too long flashes up QR-code that a 'zapper' can scan and get kudos for, but no punishment for the screen's owner.) Make sure that you can only win with the best environmental strategy. Audit tool including informal ways in which equipment is used, and fun thermal imaging tool use. Future: use the toolkit to help with demand side response (DSR) amongst staff, even to explain why the heating/aircon is currently off for hard DSR response. Ctech has been a five year project. Communication (bi-directional) is key part of energy management. Organisation goals (eg policy) and leadership matter. More understanding of data, not just more data. Technical interventions must have clear purpose and use case. Don't take agency and responsibility away from the end users. Since the impact of individual responses in the workplace is limited; so it is important to support especially team-wide collective/social responses. For a typical company/organisation: staff costs 90%, energy 1%. 101 projects analysed; 48 non-domestics. Projects evaluated with BUS questionnaires. 1000 responses across offices (15% response rate) and education (78% response rate). Electricity use tends to exceed the benchmarks in office and education, in buildings intended to be low energy. Reasonably strong correlation of energy usage to air permeability. Perceived occupants' health was strongly correlated with perceived productivity, but health was not strongly correlated with energy usage. Low ventilation (thus probably high CO2) correlated with low perceived productivity. Offices may have had ~1000ppm CO2, education 30% higher. Four BREEAM "excellent" buildings in the study: 2 offices and 2 schools. Location: south England and south Wales. What do occupants do that undermines the energy efficiency of the building? Qualitative studies of perceptions and actions in each season of end users. Occupants were willing to adapt for comfort; not thinking about energy. Some building control features were blocked by poor design (windows too high), or by 'wrong' use of spaces preventing other rooms' use of controls. Supported users adapting eg by moving to an area with a temperature comfortable for them. Some issues encountered: no FM on site, limited FM ability to manage energy, BMS data was missing. How to tailor interventions to knowledge of the occupiers? For example, designing to work even in the face of 'wrong' folk physics. Avoid siloed thinking trying to solve these issues. Design teams should provide projections of performance and running costs ... as a range. 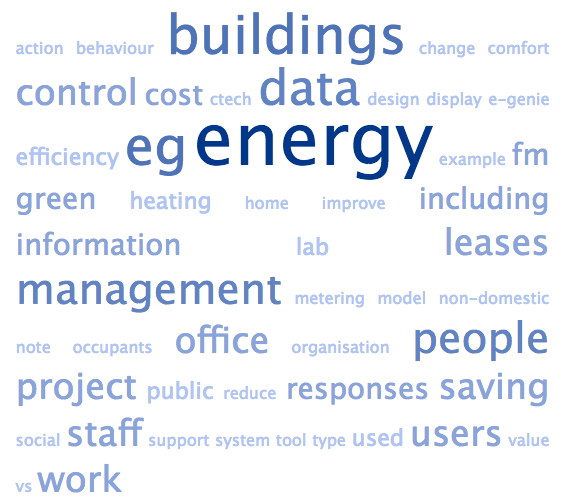 B.bem project is Bayesian building energy management. How best to parameterise occupant-related internal loads for prediction of energy demand, including demand peaks, and how to calibrate, and calculate uncertainty bounds. Monitoring the William Gates building (Cambridge Computing Lab). Functional Data Analysis: energy profile by 'function' eg students vs admin. Functional principal component analysis by peak amplitude+width and phase. Does indeed visibly cluster by building zone and thus function. This model can be used as a design tool, demand-side management tool, even fault detection. Unlike for many of the other cases of owner occupation, this is more about tenanted retail and offices. About 50% of retail and office space is rented. Looking at UK, Sweden and Australia. Leases vs leasing: lease is a piece of paper, leasing is cooperate stuff around that as tenant and and landlord. See: "The Tenants and Landlords Guide to Happiness"
Green leases can avoid split incentive problems for energy efficiency for example, and also return the building in a good state. Grean leases have additional clauses in the lease, eg green improvement clauses. They require tenant and landlord to work together in energy management, data sharing and maintain energy ratings. Green leases tend only to be used for big prime buildings. Nothing will happen if neither side wants the green leases. No one has been taken to court yet over green lease clauses. Next: private (internation standardisation would help) vs public (can be a public policy tool). 3DStock is 3D spatial model, measure and model energy use, at fine grain. VOA data indicates building (and sub-building) use. Mixed activity buildings, eg homes or offices above shops. Sometimes there are fewer meters than users: how is energy shared? How to classify buildings with multiple users, eg several offices and shops? How does the mix vary by location, eg Camden vs City of London? Is there double counting and when is a building officially non-domestic? Mixed activity buildings are a significant and difficult part of the stock, especially in dense urban areas. How to generate long-term value from the various TEDDINET bespoke data sets? Maybe the best use of a project's data will be by someone else, but how will they discover it and understand it? Just dumping it raw somewhere in a hurry at the end isn't ideal! Losing it, or forgetting it, isn't good either. Maybe institutional repositories, maybe DOI and (searchable) metadata. You may also need to develop shim ontologies to allow operations over multiple data sets. File your metadata with your data! TSV (not CSV) is good lowest-common-denominator format. DOIs are good, but don't guarantee programmatic access. Licences for data sets are also difficult, and for derived data sets. Vast majority of interviewees paid less attention to energy saving at work than at home, even though positive about energy saving in general. Seemed to underestimate costs of different types of energy. So spent more effort on say lighting efficiency even though a much smaller cost (and carbon footprint) than (eg) heating. This misunderstanding reduces effectiveness of extant attempts to economise. People feel unable and unmotivated due to lack of personal control too. Savings from upgrading controls and envelope each in the ~20--40% range. Ferkl claims MPC can save 25--27%, eg by avoiding temperature overshoots, and delivers JIT heat. Currently MPC needs hordes of PhD engineers to run it, who cost too much. Nice ways to do it: zoned temperature control with allowed deadband. IE allowing some wobble around target setpoint. It is also necessary to allow for buildings changing over time, from internal or external reasons. So maybe insert auto-generated IF ... THEN rules into existing BMS? Two projects: Gooddee2ds (public sector) and Wicked (private). How should people be involved? A partnership with users, with strategic support from the organisation, works. Lots of energy is used in labs, partly from not properly pulling down fume cupboard sashes. Why? Inconvenient? Bad examples set upon starting? Lack of concern? People feel that their autonomy is being compromised when being told what to do. Then bad habits are hard to break. Social norms to the rescue! Told lab users how open other universities' fume cupboard sashes were, including 'rival' institutions. Included self monitoring since it increased effectiveness of social norms. Did save significant energy: £500 per fume cupboard per year. New, good, habits now seem to be in place. Project in progress with city council and University of Edinburgh. Both very large and have very mixed building stock, also stated green ambitions. First understand how energy is currently being used. Looking at institutional structures and well as individuals. Lots of barriers to energy saving, eg sharing of work appliances. Talking to people at all levels in the organisation. Collected perceptions about who has control and what interventions could achieve. Process is starting to emerge. Tackling what people are currently doing in the buildings, not energy reduction (yet). What is the claimed value of doing new metering for businesses and large organisations? Looking at marketing for AMT (automated metering) companies. How do they sell their services? Truth: less aggregation; more accuracy, reliability, certainty, trustworthiness. Visibility: revealing patterns, faults, etc. Action: measure to enable better management, just like other business data. But what value is really available from more data? What capacity is there to act on that data? Interesting parallels with late 19th century, when metering was moving from lab to commercial deployment. People were debating back then if they should be paying for electricity, or the lighting service that they were using it for. We were recounted a complaint at the end of the 19th century, before electricity metering was widespread, that some electricity suppliers were charging by the number of electric light bulbs used rather than the electricity itself. LaaS (Lighting as as Service) is still a live commercial activity. Spotting open windows (leaking heat and wasting energy) automatically. Then, for example, emailing staff in various ways to try to 'fix' this. Note that staff often don't see 'heating' as energy (that can be wasted). Unlike (say) photocopiers and other electrical equipment. See the project webpage on the EPSRC website. Read the paper on Camera-based window-opening estimation in a naturally ventilated office. The results of the email interventions will be published later this year. National Energy Efficiency Data-Framework (NEED). First published 2017-06-26 , updated 2019-04-18 , rebuilt 2019-04-19 . Site copyright © 2007-2019 Damon Hart-Davis. Hosted by ExNet.